The ongoing effort to reform the sacred liturgy within the Ordinary Form of the Roman Rite often begins with the reintroduction of several traditional practices. A greater use of Latin, the return of communion rails, and even (on occasion) the offering of the Holy Sacrifice ad orientem. One area that has been much slower to see reform, however, is in the selection of music used at Mass. On more than one occasion I have had a pastor express the great difficulty faced when looking to address this single aspect of our worship. It would seem that many of the faithful have grown quite possessive of their favorite OCP hymns over the years. After all, what is Mass without those sweet sounds of the seventies and eighties courtesy of Marty Haugen and David Haas? What would Mass be without the modern, first person, “We as Jesus” hymns like , “I Am the Bread of Life” being sung during Holy Communion? Of course, I am only kidding. However, the reality that many others have actually grown attached to these songs over the decades, requires charity when introducing change, and can make musical reform very difficult at times. Just ask any pastor who has taken on the challenge. This brings us to the Diocese of Marquette and a pastoral directive issued by Bishop John F. Doerfler earlier this year. The topic: an instruction on what music will be permitted for use at diocesan Masses. Make no mistake about it; this is a bold move. What is even more impressive is that Bishop Doerfler is simply building upon the foundation laid by his immediate predecessor, Bishop Alexander Sample (now the Archbishop of Portland, OR). Imagine this revolutionary concept: liturgical continuity from one bishop to the next! Ultimately, the purpose of sacred music within the Mass is to glorify God and sanctify the faithful, not to generate an emotion or provide a form of religious entertainment. With his INSTRUCTION ON SACRED MUSIC IN DIVINE WORSHIP, Bishop Doerfler has gone from a theoretical discussion of promoting Sacred Music in his diocese, to actually implementing the necessary steps to make it a reality. He has mandated that the following directives are to be implemented by ALL parishes and Catholic schools in the diocese by December 31, 2020. More importantly, however, he has provided the green light (and frankly, the cover) for those pastors who wish to begin these integral reforms sooner than later. 1. All parishes and schools will learn to chant the Ordinary parts of the Mass in English that are found in the Roman Missal, and they will be sung by the congregation some of the time throughout the year. 2. All parishes and schools will learn to chant the KYRIE, SANCTUS and AGNUS DEI from the Missa lubilate Deo, and they will be sung by the congregation some of the time throughout the year. 3. All parishes and schools will learn to chant the Communion Antiphon in English to a very simple tone that everyone can sing, and the Communion Antiphon will be sung at every Sunday Mass. A hymn may be sung after the Communion Antiphon while the congregation is receiving the Blessed Sacrament. 4. A Diocesan Hymnal will be used to ensure the musical quality and doctrinal integrity of the Sacred Music. The hymnal will include a broad repertoire of hymns from classical to contemporary. 5. The Diocesan Director of Sacred Music will provide annual, regional workshops for parish musicians to assist them in the implementation of these directives. He will also assist music teachers in Catholic schools to implement Sacred Music in the school curriculum and at school Masses. Finally, he stands at the service of parishes upon request to help implement Sacred Music in other ways. 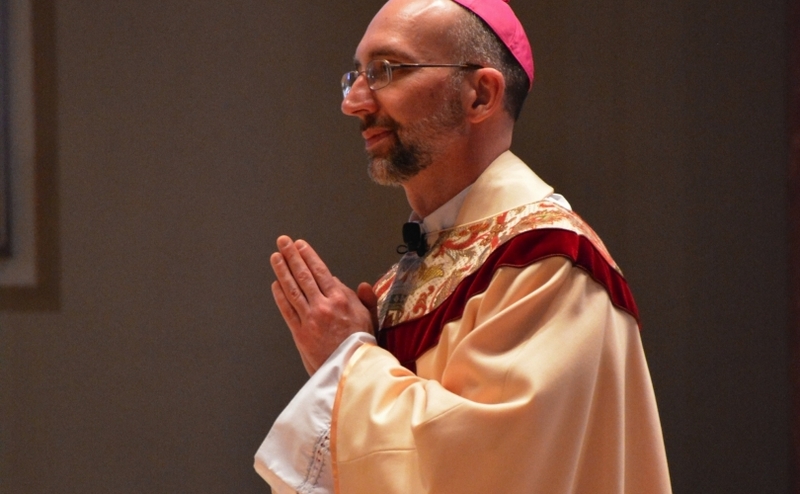 Let us dare to hope that in the coming years we see more bishops take such bold and decisive steps as Bishop Doerfler has done to restore sacred music to the Holy Mass. Posted on June 18, 2016, in liturgy and tagged bishop alexander sample, Bishop John Doerfler, Diocese of Marquette, sacred music. Bookmark the permalink. 26 Comments. His Excellency “has provided the green light (and frankly, the cover) for those pastors who wish to begin these integral reforms sooner that [sic] later.” With this formal guidance from the top, it’s as if the way has been cleared for his young priests to begin traveling down the path of liturgical restoration. This is wonderful news! “Imagine this revolutionary concept: liturgical continuity from one bishop to the next!” Make one sorry for the people of Chicago. He’ll yes finally a great Bishop doing his job and off the gravy train. Keep it up. Because the Great Lakes region in which Marquette is located is in the Episcopal Church called “the Biretta Belt”, the center of the High Church/Anglo-Catholic movement, if you go to most Episcopal parishes in the area, the look, sound, and feel of the liturgy is much more like a traditional Roman Catholic liturgy than actual Roman Catholic ones. As for a hymnal, the ECH1982 could be used quite well in a RC church with a Marian supplement. The 1940 Episcopal Hymnal would be even better. Trying to put a sense of the sacred into the vatican two silly mass is like putting lipstick on a pig. We are so blessed to have Archbishop Alexander Sample in Portland Oregon, a beautiful but godless state. We desperately needed his leadership and he is making a difference in some of the previously “happy clappy” music popular at some parishes. Also in our parish Fr Eric Anderson and Fr John Boyle have turned around a dying parish, St Stephen with a great emphasis on the sacred. Latin Mass has been introduced with other traditional elements. There is hope here in the land of Sodom. It would warm my heart if His Excellency banned Marty Haugen and David Haas music by name. Do we all need to move to Wisconsin. Bp Morlino holds similar views. Reblogged this on Christian Renaissance Movement. I love the St. Louis Jesuits and refuse to apologize for it: most of their songs are like prayers. God Bless this good Bishop! He knows that lex orandi, lex credendi leads to vita vivendi! I previously followed the moves made by His Excellency, Bishop Sample. So happy to see that also his successor goes in the same path. God bless!!! There is great contemporary music in the OCP. There is also a wealth of Latin and other early plain songs which help us to pray and bring everyone along instead of the “soloist” mentality. It’s gonna take a while, but I hope we can make it in our CHurch Universal. Sometimes no music is better than Bad music. In Hawaii, we are singing the call and response of the liturgical prayers. Alleluia! It would appear that the baby is coming back out of the bath water!!!!!! Beauty, and constitutes “sacred”, are very subjective. And until the Church offers classes in understanding Latin, they should hold off on using it. In many parishes, there are Masses in multiple languages. Why? Because people want to pray in the language they understand best. Remember Psalm 137, vs 4? “But how could we sing a song of the LORD in a foreign land?” If we are in a place where we don’t understand the language, does that not place us in a foreign land, liturgically? So if there is a desire for a return to a language most don’t speak or understand, please start by teaching the language first so that we can pray it rather than speaking rote. Opening the doors and windows,see Vatican II.The reverse action occurred rather than letting in light and fresh ideas.The openness that was to attract people caused harm to our priests.It became a contest to see who become the most modern. New churches became gyms.Mass became a social meeting place.No longer reverence toward the Blessed Sacrement,does the real Presence mean anything any more? Last year I attended a Latin Mass in a city out west. The priest was unfamiliar with Latin and his clearly Anglicized pronunciation was a distraction. English would have been better. JJ Decker, I’m sorry you may have had some bad experiences, but that’s certainly not the case in many parishes. To paint with such a broad stroke is not very charitable. John Malin, it raises the question how one is expected to pray in a language one does not understand.